The Brew Your Own Big Book of Clone Recipes was released in May of this year. If you are struggling to find a gift for the home brewer in your life, get him or her a Columbus Brew Adventures gift certificate and a copy of this book. It was produced by Brew Your Own magazine which has helped home brewers clones recipes from their favorite breweries since 1995. The book features 300 recipes that have been tested and retested and troubleshot by the magazine. So what is a clone beer you ask? Is it related to Star Wars in some way? Thankfully, no. Clone beers are created to very closely resemble the famous and infamous commercial beers they are modeled after. In the case of Brew Your Own Magazine, they often work with the actual brewers to make sure they get the recipes right. 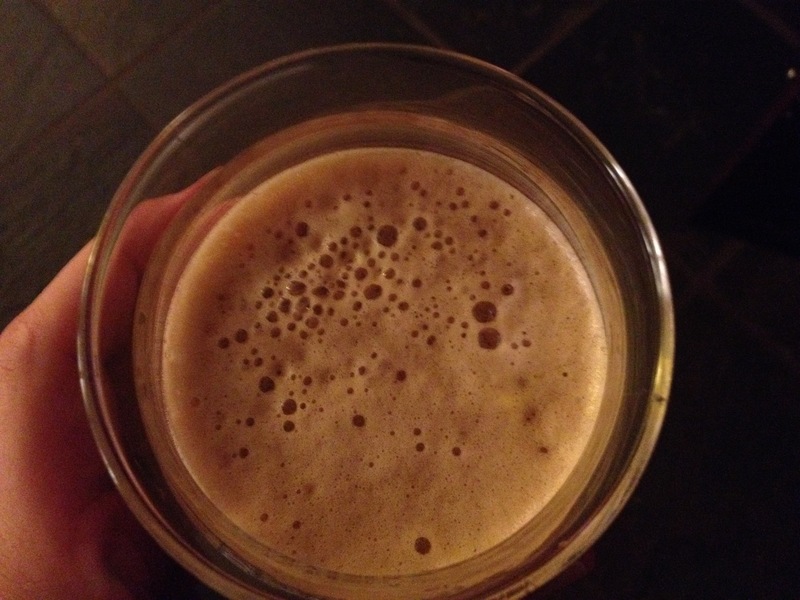 So why would a home brewer want to make a clone of someone else’s beer? There are many reasons. For some it is an homage to the beer that inspired them to start brewing. Sometimes it is price, they don’t want to pay retail for a beer they love. 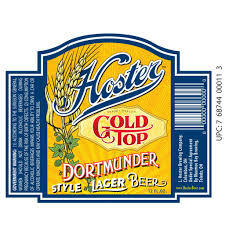 Other times, it may be to create a beer that is no longer on the market or impossible to find. In some cases it is a quest to take that base and tweak it just a bit to determine the what if’s of brewing. The book has a brief forward and overview of the philosophy of clone brewing then very quickly jumps into the actual recipes. These are the 17 categories the beers are divided into: Pale ales, India Pale Ales, Specialty IPA’s, Amber ales and lagers, brown ales, porters, stouts, Imperial Stouts, Barleywine and strong ales, Belgian Style ales, British style ales, European ales and lagers, North American ales and lagers, Pilsners, fruit, spice and vegetable beers (pumpkin), Sour, Wild and Wood Ages beers and Winter beers. If that seems like a lot, it is, the book is 272 pages. You will find a wide variety of beers in here including Dogfish Head, Southern Tier, etc. This definitely not a book for beginners but it is worth having as a reference or inspiration for anyone that have the home brewing bug. I also like the title, when I was a young lad, I recall there were a lot of Big Books of __________ but I never saw one of beer. Now I can take that off my bucket list. (I was offered a free copy of this book by the PR firm working with the publisher and I responded to that e-mail query very quickly. My vocation puts me in almost daily contact with home brewers and home brewers whose hobby has gotten out of control causing them to then start breweries, so I knew I would find a good home for this book when I was done with it, some day will actually make one of these recipes). While this is and has always been a food first blog, this is not the first time I have written about a theater, nor the second nor the third. I have written about Studio 35 before, While not a food purveyor in any sense it has a long history as a local craft beer supporter and destination. So let’s do a recap on Studio 35 because it is the key to what makes the Grandview Theater tick. In the world of megaplex movie theaters with multiple screens, extensive concessions, IMAX, 3D and other options it is hard for a neighborhood single screen theater with mo on site parking to survive. In fact most have not (nor have many drive in’s sustained either). The plucky Studio 35 continued on through the 80’s, 90’s and now in the 21st century looking for ideas to make the business responsive to the needs of the community. Owner Eric Brembeck took over the reigns after years of stewardship of Frank Marzetti and then John Conti. (Some historical notes: originally called the Indianola Theater when in opened in 1938, the name changed to Marzetti and then John Conti renamed it Studio 35 (because they showed 35mm films). Also of note, Studio 35 was the first movie theater in the nation to get a liquor license (in 1972). Now that we have been through the wayback machine when Eric Brembeck took over the theater was still limping along so he and his team started to focus on what customers connected with – mainly craft beer and special events. The bar developed a reputation for a finely curated craft beer selection. In addition to movies paired with special beer tastings, Studio 35 started to develop other special events most notably the Dudeathon (a tribute to the film The Big Lebowski). And file under if you can’t beat them, join them, the theater invites the public to come watch OSU games for free. The theater was renovated a few years ago to make the bar much bigger with more seating and tabs and to make everything much more comfortable. Now that the back backstory is completed let’s finally talk about The Grandview Theater. I have a long relationship with this spot as well. It was favorite destination for me when it was a Drexel Theater. When the previous owners took over in 2012 (?) I met them while I was at ECDI and tried to brainstorm ideas to help them keep the theater afloat. Both owners worked all day and ran the theater all night but their passion for the art of movies did not balance out the demands of keeping their business sustainable while burning both ends of the candle. Enter new owner Eric Brembeck who thought he could take the Studio 35 model and adapt it to Grandview. His first step was to acquire something the theater lacked – a liquor permit. After he obtained that, a lot of demolition and construction later we have the new Grandview Theater. There is a lot to like. The layout of the space is fun and functional with plenty of movie posters and such to decorate the space. The bar is deep in seating and beer selection. While popcorn is the main attraction for on site food there is an array of different seasonings to sprinkle or smother on as you see fit. Pizza can be ordered in for delivery just like at Studio 35. Moving into the theater itself, the seats are wide, deep and comfortable with wide aisles between seats. There are tables at the top of the seating area so you can dine while enjoying the cinema. All in all everything works well and recreates the magic of Studio 35 using the same focus on connecting with the community and being a neighborhood hangout that just happens to have movies too. Here is where civic duty comes in. Independent businesses like this contribute to the character of our neighborhoods as well as our sense of community. If you want places like this to continue they have to survive and thrive so that they are not constantly trying to rub two pennies together to keep the marquee lit. All you need to do is drop in for a beer and/or a movie once in a while. The Grandview Theater has made this an inviting place do so. So, just do it. Rockmill Brewery opened to the public in Lancaster in September of 2010. I was there shortly thereafter in November of 2010. It is interesting to reflect how much the world and in particular my world has changed in the span of just six years. In the world of local craft beer, imagine if you will the thrill when Rockmill nudged central Ohio breweries closer to the number ten. At my last count, we can expect to see well over forty microbreweries in Central Ohio by spring. With all of these changes afoot, owner Matt Barbee knew he needed to get a bigger footprint in the Columbus market and he realized the best way to do that was to establish a taproom(s). An attempt to open a location in German Village fizzled out but another location he had in the works in the Brewery District found some solid traction and uncommonly launched close to on time. Rockmill Tavern opened it’s doors to the public at the end of October this year. This was pretty amazing turn around, the previous occupant, World of Beer closed without warning on October 31st 2015. Barbee had much of his attention devoted to making the prospective German Village location come together so the Brewery District tavern was fast tracked as the other project got sidelined. The space has a lot of history that fits well with his concept. The space was literally made for beer. The original occupant of these hallowed brick walls was Hoster Brewing Company. Up until 1919 this address on Front Street was part of one of the largest breweries in the state churning out up to 500,000 barrels of beer per year. Rockmill’s production is a bit below that number (by about 490,000 or so). The particular space the tavern fills was once part of a stable for 125 horses for Hoster Brewing. So it is fitting that Rockmill’s logo is that of a horse. This truly was a match that was meant to be. I am excited about this development for many reasons. I have stayed in touch with Barbee since our first meeting years ago and have always been impressed by his vision and focus on how he wanted to grow the brewery and engage with the community. As for the Brewery District, I feel that the opening of Rockmill Tavern marks the official rebirth (3.0) of the Brewery District. If you are not a native of Columbus then you are probably not aware that the Brewery District was the place to be in the 1990’s. And in the early 2000’s it very quickly became the place to flee. A few businesses stuck it out and in the last year the area has seen a significant upswing with the success of Copious, Arepazo and other new hot spots. The main downfall of the World of Beer location was a lack of food. Some failed attempts were made to try to coordinate with food trucks but those efforts were…uncoordinated. Barbee saw the potential in the space but knew the key was to squeeze in a kitchen to churn out something better than fried fare and wings if he wanted guests to stick around for more than one beer. He ensured a slam dunk for food by engaging great talent in both the front and the back of the tavern. In particular, Chef Andrew Smith, most often cited for his work at Salt and Pine but in my book, well respected for his work at the Rossi. As for the food, they have nailed it. Open a short two months, I have seen Rockmill Tavern listed as the best new restaurant of 2016 as well as noted on the short list of best overall. Not bad considering they have just started cooking. I can only speak to the lunch menu but looking at dinner and brunch offerings I see nothing to fear in this line up. I shared lunch with a few members of the Columbus Ale Trail team and was lucky to be in the company of two young ladies that share the same affinity for Brussels sprouts and beets that I do. I’ll start with the sprouts. While they seem to be ubiquitous to any new menu in town I rarely find them executed to my liking. Those that I sampled at Rockmill Tavern were cooking to my loving. The portion size was perfect. They had just a bit of char to them and a trace of carmelization. They tasted fresh and flavorful with just a hint of crunch and chewiness. Moving on along, the beet salad was a slam dunk. I don’t often fret about presentation but in the case of this salad it certainly looked good enough to eat but more importantly the layout of the ingredients made the salad easy to enjoy. The goat cheese was an ample portion and placed in such a way that I could easily control how much or how little I wanted with each bite. The beets themselves were cooked to pure perfection. I could not have been happier and I commit to ordering this salad whenever I am at Rockmill Tavern, even when I am not there to eat. Here is an insider tip. I usually don’t get excited about biscuits. In my world I associate them with breakfast more often that lunch, brunch or dinner. More importantly, I encounter bad biscuits 90% of the time. Finally, I found a biscuit worthy of this quote -> Poetry is the synthesis of hyacinths and biscuits. – Carl Sandburg. The addition of a bit of cheese and a lot of love has produced the finest biscuits in the city. And since readership of the blog is down, I am going to give my readers a little insider knowledge (but don’t spread this around). If you know Cheryl Harrison (and you probably should because she is a good idea) then you should know that she LOVES these biscuits. If she had her way, they might become a form of currency. And last, but not least, the Tavern burger – made from good ground beef and not dolled up too much but I did appreciate the ciabatta bun and the bacon jam. It continues along my burger mantra of keep it simple to make it special. A burger should just be a burger but most places threw this belief out the window years ago. Don’t pitch this burger, pinch it in your hands and hold on to it for dear life until you finish it. In conclusion, most importantly, I am very happy for Matt Barbee. The Rockmill Tavern is a place and space that truly reflects his passion(s), not just for beer but the design of the interior and the rugged feel it projects connects with both the history of the building and the history of his brewery. When I met him six years ago, I enjoyed a great afternoon at a time when I really needed to reconnect with the good things he had going on in Lancaster and I feel all of those elements have successfully landed in this Brewery District space. (And extraneous note, I am writing this piece sitting next to my co-pilot on that first Rockmill trip – my dog CMH Tobias). Go for the food and stay for the beer and equally important, stick around in the Brewery District and help rebuild the area, one beer or bite at a time. I have been fortunate to be able to expand the overlapping cultures/communities I belong to. In the early 2000’s I found myself in the newly established food blogger community, which led to the undiscovered world of Taco Trucks which then drove me to the culture of street food which indirectly led me to a new career which in turn connected me to some in the world of Columbus Craft Beer just before the explosion of craft breweries in 2013 and after. Along the way I collected some new skills, some friends, business relationships and etc. All of those overlapping networks led to a spontaneous project. Several of us had encountered versions of craft beer trails around the country. My neighbors brought me a flier from Boston that got me to thinking about how it might work in Columbus. John from the Ohio Tap Room contacted me about the same idea at about the same time and within a week we had a group of four of us that then connected with the Ohio Craft Brewers Association, who were just starting to have that thought as well. At that point we thought Experience Columbus might be interested so we met with them. We all thought a Columbus Craft Beer passport of some sort made sense and thus the Columbus Ale Trail was born. It was a very quick gestation. We decided we wanted to launch the Ale Trail at the beginning of the first ever Columbus Craft Beer Week. This meant we had to create something awesome from scratch in less than two months. Many hours, and ideas, and late night edits later, the first Ale Trail Brew Books were ready for delivery. They started to filter out on May 1st and the first prize redemption for visiting all twenty breweries was on May 2nd. Oh my, we were on to something. The first 10,000 books were gone within a few weeks. With that validation and some quick planning and a bit of tweaking we obtained funds from the breweries to print another 20,000 books. Today with just a few days left in the first year of the Columbus Ale Trail, the project has been a slam dunk. Over 600 people have visited all 20 listed breweries. Almost 1000 have visited 4 breweries to get a free pint glass from Experience Columbus. And countless people have visited one to nineteen breweries just for the heck of it without redeeming for anything. It has been exciting, humbling and for me, redeeming as well. It is great to be part of an idea that turns out to be successful and in the process helps all of the small brewing businesses get new fans and grow their brands. As I write this, Volume 2 of the Columbus Ale Trail Brew Book has been sent off to the printer (after a lot of edits, and formatting, and changes, and bears, oh my!). The prize for completing the trail this time around (28 breweries) is a customized deck of cards featuring logos from almost all of our local breweries. It looks great. (See a card example below). The books should be ready by May 13th and the cards should be ready to hand to the first person (and all subsequent Ale Trailers) to go to all 28 sites (hopefully) within the following week. Over the course of the past year I have personally passed out almost 2000 Ale Trail books to people on brewery tours. I’ve spoken with over 100 people using the books as I have crossed paths with them at breweries all over Central Ohio. The consistent message is: This is great! I can’t say that anytime in my professional career have I been lucky enough to work on a project that was universally loved like this. What I have heard frequently and what I like the most is that people enjoy the book – because it is a book, not a gadget, or app but something real and tangible that they enjoy looking at, reading through and most importantly getting the stamp (of approval) at each brewery they visit. While I have heard great stories, my two favorite are documented below and I was lucky enough to have a small part in each. The two ladies below completed their Ale Trail last fall. They enjoyed it so much they made costumes to wear to their last few stops. I met them at the Ohio Taproom where they came to get their Ale Trail T-shirt to reward them for their efforts. I hope they get to wear these costumes again for Volume 2. The image you see below is a cautionary tale. A couple came into the Ohio Taproom while I was wrapping up a tour there. The wife was excited but the husband seemed a bit forlorn. As it turned out, only she was redeeming. He shared a tale of woe in that he had pocketed his book after they hit the last stop, forgot about it and washed his pants without removing the contents. The results are shown below. As part of the Ale Trail team, I authorized the shreds of book as complete and he was validated for finishing the trail too. Lesson for Volume 2, keep your Ale Trail book in a special place and monitor closely. Friends don’t let friends lose or wash a perfectly good Ale Trail book. Good luck to all racing to finish Volume 2 of the Ale Trail and congratulations to those that finished all or most of Volume 1. For the last four years, October has been a big month for Four String Brewing’s Dan Cochran. In October 2011, after months rehabbing an old machine shop, Four String was born just ahead of the Columbus Craft Beer Boom 2.0. In 2012, the space was taking shape with some retail customers including the BW-3 (Buffalo Wild Wings to you millennials) across the parking lot and some momentum. Cochran was working by day and brewing by night and picking up extra equipment where a small budget on a debit card would allow. In 2013, October was a double blessing. Changes in regulations allowed Cochran to open a bona fide taproom so that people drop in for a pint instead of a taste and a growler fill that felt like something clandestine. Cochran added a new baby Cochran to his team as well. Things were looking up and Cochran was fully invested in brewing full-time. 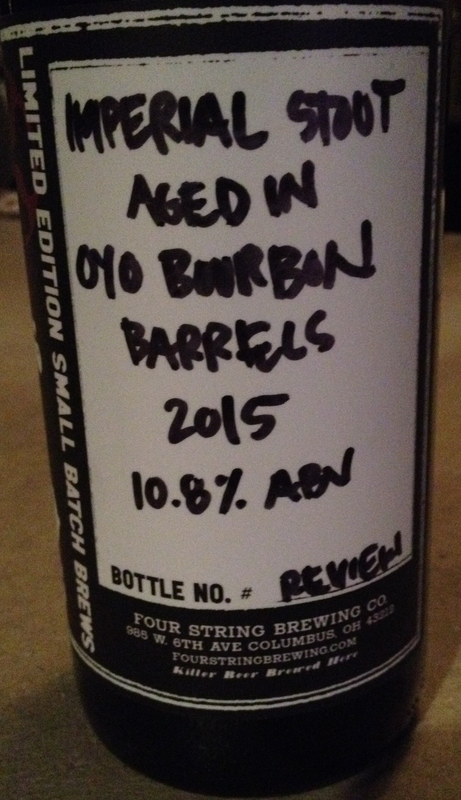 As fall of October 2014 arrived Four String was committed a big jump to partnering with a distributor and starting to can beer to get it to the masses. As canning became a weekly ritual (and rite of passage for many loyal volunteers) the cans took hold of a large market and a tipping point tipped. This year, October is still a big deal for Four String. A new production brewery on the “near west side” is cranking out kegs, casks and cans, Cochran has or will soon add another baby to the brood, and the taproom is transformed after a few days of hard work (last week) has doubled in sized as a new space even long time regulars would not recognize. Things are looking good for Four String and as a business that literally started on a shoestring that is a big deal. 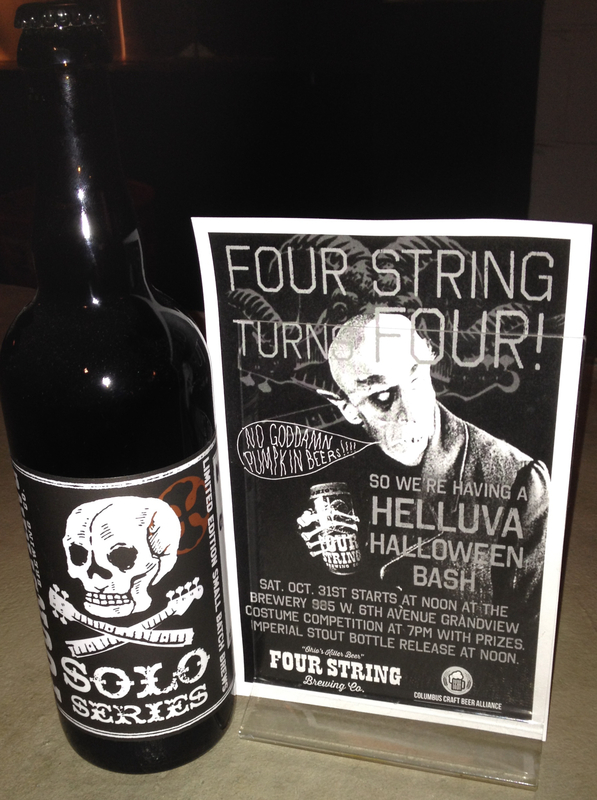 And because that is a big deal Four String is going all out with a four year anniversary party paired with Halloween and a BIG bottle release. The party is October 31st at the Taproom and it should be a doozy. October 31st is more than a bottle release and party at Four String, it is a celebration of a dream. I’m raising my glass below.